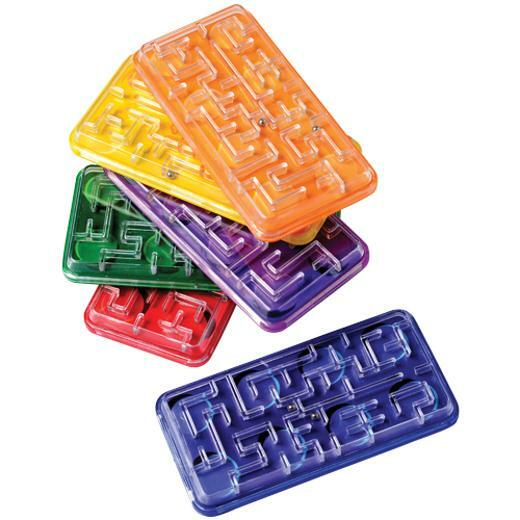 Cheap Block Mania Maze Puzzles - 6 Ct.
Block Mania Maze Puzzles - 6 Ct. Designer Wheel Yo-Yos - 12 Ct.
Ball And Cup Games - 12 Ct.
Pirate Maze Puzzles - 12 Ct.
Finger Spies - 12 Ct.
Wiggle Eye Pencil Wraps - 12 Ct.
Block Mania Disc Shooters - 12 Ct.
Rainbow Glitter Water Bracelets - 12 Ct. Smile Paddle Balls - 12 Ct.
Mini Smile Yo-Yos - 12 Ct.
Butterfly Rings - 12 Ct. Challenge the minds of your young builders with these Block Mania-themed maze puzzles. Modeled after his favorite toy, the race is on to maneuver the little ball inside through the brick building patterns kids love to reach the finish line. Beware of the dead ends hidden throughout. The perfect party favor to "build" a fantastic Block Mania event! L: 4.0 in. W: 1.15 in. H: 6.8 in.